Tallulah Brockman Bankhead (January 31, 1902 – December 12, 1968) was an American actress, who, in a long career spanning several decades, played leading lady in some of the most notable productions of twentieth century theater including Clifford Odets, Clash by Night, Lillian Hellman's Little Foxes, and Thornton Wilder's The Skin of Our Teeth, for which she earned the New York Drama Critics' Circle Award (1942). Sometimes referred to as a "Southern belle" or a bon vivant, she was a diligent and dedicated actress who cultivated a comedic persona with her distinctive husky voiced resonance. (Some of her quotes and quips, like "really daaahling," will forever live on in the annals of American theater history.) Later in her career she played roles where she was essentially playing herself—an outrageous and outspoken critic of conventional norms and politics00as a radio, talk show, and television host and supporting cast member in various sitcoms, some of them now considered classics. She came from a prominent Alabama political family—her grandfather and uncle were U.S. Senators and her father served as Speaker of the House during Franklin Delano Roosevelt's term. She struggled with alcoholism, drugs, promiscuity, and nonstop smoking in her personal life but the accounts of her kindness and generosity to those in need is legendary, including helping several prominent families escape the chaos of the Spanish Civil War and World War II. Bankhead was born in Huntsville, Alabama, to William Brockman Bankhead and Adelaide Eugenia Sledge and was named after her paternal grandmother. Her mother, Eugenia, died on February 23, 1902, three weeks after giving birth to Tallulah. Her father went into a depression and Tallulah, in part, carried the guilt of having caused her mother's death. Even at a young age, she had a gift for mimicry. She would commit to memory Shakespearean soliloquys and relished parts in school plays. Her father, who remarried when Tallulah was twelve, admonished her once for giving impressions of her stepmother. He told her, "The place for people to give impersonations is on the stage!" and so the seed was planted. Another time, after seeing Mary Pickford and Lillian Gish in the silent movie Good Little Devil she made up her mind that she too would become an actress. Bankhead came from a powerful Democratic political family in the South. Her father was the Speaker of the United States House of Representatives from 1936-1940 (in the 74th, 75th, and 76th Congresses), immediately preceding Sam Rayburn. She was the niece of Senator John H. Bankhead II and granddaughter of Senator John H. Bankhead. Her older sister, Evelyn Eugenia Bankhead, was born January 24, 1901. The sisters shared a closeness born from their common experience of being farmed out to either relatives or boarding schools. While this closeness waxed and waned throughout the years, Tallulah was dedicated to the welfare of her sister throughout her life. Her family sent her and Eugenia, cared for mostly by their grandparents after their mother's premature death, to various schools including a year at a Catholic boarding school (although her father was a Methodist and her mother was an Episcopalian). Tallulah, teased about her name and "too tense and restless to concentrate on paper" soon found a way to avoid formal schooling. At 15, Bankhead won a movie-magazine beauty contest in Picture Play and convinced her family to let her move to New York City with her Aunt Louise serving as chaperone. "The family thought that if I had no talent the best cure would be to let me on the stage and if I really had talent, why the stage was the place for me." She quickly won bit parts, first appearing in a non-speaking role in The Squab Farm. During these early New York years, she became a peripheral member of the Algonquin Round Table. Young and inexperienced, she skirted trouble and wrote home regularly to reassure her family, who were providing her both financial and moral support. She became known for her wit, although as screenwriter Anita Loos, another minor Roundtable member, said: "She was so pretty that we thought she must be stupid." She became known for saying almost anything, whether true or not. Perhaps already blurring the distinction between her on-stage persona and her off-stage self, Tallulah commented, "I prefer a character part to any other role, if the character is just true to life. I want emotional roles. The eternal ingenue means nothing…." Her first speaking role was in 39 East (1919), however, she only made six appearances before the play was closed by an actor's strike. Her role in Rachel Crothers' Nice People (1921) was her first vehicle for displaying the caustic repartee of high drama for which she was to become so well-known. In search of new acting opportunities Bankhead moved to London. There, Sir Gerald du Maurier, father of authoress Daphne du Maurier, and one of Great Britain's artistic leaders in the tradition of "actor/managers" at the turn-of-the century, cast her in The Dancers (1923). So enamored of her were theatergoers that she often inspired audiences (in an age when theater was at its peak in providing live entertainment) to tumultuous reactions. One biographer stated, "to many she personified the exuberance of the 1920s, and to catch a part of that spirit for themselves, women copied her fashions, affected her manner, and even imitated her husky voice. Her fame as an actress was ensured in 1924, when she played the waitress Amy in Sidney Howard's They Knew What They Wanted. The show went on to win the 1925 Pulitzer Prize. Her growing popularity could be attributed not only to her evolving flair for comedy but also to her effervescent personality which spilled over into her live performances. In Tallulah! 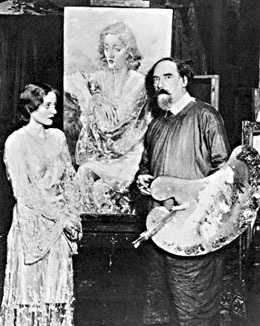 playwright and critic St. John Ervine is quoted as saying in his review for New York World (Sept. 1928) "She reverses the established canon of acting, that an actor gains control of his audience by keeping control of himself, for she gains control of her audience by losing control of herself … she seizes and holds and keeps her audience." She performed in sixteen plays during her eight years in England. In 1931, under contract to Paramount Pictures she returned to the U.S. and played in a series of roles as a femme fatale in films like George Cukor's Tarnished Lady (1931), My Sin (1931), and Devil and the Deep (1932). Although "talkies" were fast becoming the rage her stage vitality failed to come through in the medium of film. Additionally, it was hard to compete with the comedic greats of the era such as Carole Lombard or with the foreign allure of either Greta Garbo or Marlene Dietrich who she was sometimes compared to. And although her southern upbringing made her an ideal candidate for the part of Scarlett in the epic film Gone with the Wind, director David O. Selznick decided that she was too old (at age 34) for Scarlett's antebellum scenes. Offered instead the part of fallen woman Belle Watson, she refused. Unable or unwilling to persist in Hollywood, Bankhead returned to her most-loved acting medium, the stage. Complaining that the camera was stifling she said, "Put me on a lighted stage before a crowded house and I'm myself." Returning to Broadway, Bankhead's career stalled in unmemorable plays until she played the cold and ruthless Regina Giddens in Lillian Hellman's The Little Foxes (1939). Her portrayal won her Variety's Best Performance Award, but Bankhead and Hellman feuded over the Soviet Union's invasion of Finland. Bankhead (a staunch anti-Communist) was said to want a portion of one performance's proceeds to go to Finnish relief, while Hellman (an equally staunch Stalinist) vehemently disagreed. Their feud, which played out in the press, most likely cost Bankhead the chance to play the role of Regina, her pièce de résistance, when the play was staged in London. The play's tour concluded in 1941, in Philadelphia, the same year Bankhead and husband, actor, John Emery divorced. Bankhead married him on August 31, 1937, in Jasper, Alabama. They divorced in Reno, Nevada. More success and the same award followed her 1942 performance in Thornton Wilder's The Skin of Our Teeth, in which Bankhead played Sabina, the housekeeper and temptress, opposite Fredric March and Florence Eldridge (who were married both on stage and off). Although the headstrong Bankhead battled neophyte director, Elia Kazan behind the scenes, the play, controversial and unusual for its time, won the Pulitzer Prize and garnered Bankhead the New York Drama Critics Award. Lewis Nichols wrote in the New York Times, "She can strut and posture in broad comedy, she can be calmly serene. How she contrives both, almost at the same time, is a mystery to a mere man. It is a great part and she rises to it magnificently." In 1944, Alfred Hitchcock cast her as the cynical journalist, Constance Porter, in Lifeboat. The performance is widely acknowledged as her best on film, and won her the New York Film Critics Circle Award. After World War II, Bankhead appeared in a revival of Noel Coward's Private Lives, taking it on tour and then to Broadway for the better part of two years. From that time, Bankhead could command 10 percent of the gross and was billed larger than any other actor in the cast, although she usually granted equal billing to Estelle Winwood, a frequent co-star, and Bankhead's "best friend" from the 1920s until Bankhead's death in 1968. Though Tallulah Bankhead's career slowed in the mid-1950s, she never faded from the public eye. Bankhead continued to perform in the 1950s and 1960s on Broadway, in the occasional film, as a highly-popular radio show host, and in the new medium of television. Her appearance as herself on The Lucille Ball-Desi Arnaz Show in 1957, is a cult favorite, as is her role as the "Black Widow" on the 1960s campy television show Batman, which turned out to be her final screen appearance. In 1950, in an effort to cut into the rating leads of The Jack Benny Program and The Edgar Bergen & Charlie McCarthy Show which had jumped from NBC radio to CBS radio the previous season, NBC spent millions over the two seasons of The Big Show starring "the glamorous, unpredictable" Tallulah Bankhead as its host, in which she acted not only as mistress of ceremonies but also performed monologues and songs, many of which can be heard on the album Give My Regards To Broadway! Despite Meredith Willson's Orchestra and Chorus and top guest stars from Broadway, Hollywood and radio—including Fred Allen, Fanny Brice, Groucho Marx, Ethel Merman, Gracie Fields, Vera Lynn, Jimmy Durante, Dean Martin & Jerry Lewis, George Jessel, Judy Garland, Ethel Barrymore, Gloria Swanson, José Ferrer and Judy Holliday, The Big Show, which earned rave reviews, failed to compete with the growing popularity of television. Bankhead, who proved a masterful comedienne and intriguing personality, however, was not blamed for the failure of The Big Show—television's growth was hurting all radio ratings at the time, so the next season NBC installed her as one of a half dozen rotating hosts of NBC's The All Star Revue on Saturday nights. Although critics and fans alike loved her, and some of Tallulah's monologues became classics, she was not among the hosts renewed for the following season. In 1956 Bankhead appeared as "Blanche DuBois" in a revival of Tennessee Williams's A Streetcar Named Desire. The part of an aging southern belle was well suited to Bankhead but she found the role rigorous, referring to acting the part of Blanche as harder than 18 King Lears with a Hamlet thrown in. She received a Tony Award nomination for her performance of a bizarre 50-year-old mother in Mary Chase's Midgie Purvis (1961). Her last theatrical appearance was in another Williams play, The Milk Train Doesn't Stop Here Anymore (1963). Although she received good notices for her last performances, her career as one of the greats of the American stage was coming to an end. Her last motion picture was a British horror film Fanatic (1965) co-starring Stefanie Powers, which was released in the U.S. as Die! Die! My Darling! Although she was in the advanced stages of emphysema her role in the movie was described as a tour de force by one biographer and a departure from anything she had taken on in the past. Bankhead always found that acting before film was a medium that she was not entirely comfortable with. She complained about delivering her lines out of context saying, "I can't pick up the middle of a sentence in the middle of eighteen verses and get any feeling in it." On May 14, 1968, Bankhead was a guest on The Tonight Show with Joe Garagiola as the guest host, along with John Lennon and Paul McCartney. They were in New York City to announce the formation of their new company, Apple Records. Bankhead, reportedly a bit inebriated, told Lennon and McCartney that she would love to learn how to meditate, as they had in India with the Maharishi in February of that year. Around that time, fans were shocked to see Bankhead on the cover of The National Enquirer. The tabloid informed its readers that the actress was aware that she had only months to live. "There's nothing you, or I, or anybody can do about it," she was quoted. A long-time smoker, Tallulah Bankhead died in St. Luke's Hospital in New York City of double pneumonia arising from influenza, complicated by emphysema, at the age of 66 on December 12, 1968, and is buried in Saint Paul's Churchyard, Chestertown, Maryland. Bankhead had no children, but was the godmother of Brook and Brockman Seawell, children of her lifelong friend and actress Eugenia Rawls and Rawls's husband, Donald Seawell. Like her family, Bankhead was a Democrat, but broke with most Southerners by campaigning for Harry Truman's reelection in 1948. While viewing the Inauguration parade, she booed the South Carolina float which carried then-Governor Strom Thurmond, who had recently run against Truman on the Dixiecrat ticket, splitting the Democratic vote. In April of 1959, she testified before Congress to advocate a bill providing unemployment insurance for actors. Bankhead's career experienced many highs and lows and was often fraught with adversity from actor's strikes to the stinging reviews of her critics. While some career vagaries were brought on by herself; poor decisions regarding her career choices, and alcohol consumption, much of the unevenness of her career was due not to her own lack of effort and dedication but to the very capricious nature of the entertainment world itself. In later years she gave these words of advice to a young actress during the run of The Milk Train, "You can only tell the truth and you can only tell the truth about what you know… use what you know, what you've lived." Drawing on some of her own painful experiences she breathed life into some of the most difficult and iconic parts of twentieth century theater. Although she was often criticized for "playing herself" or even for being too "technical" she believed in a naturalistic dialog and scorned method acting as something actor's already did naturally. "If you act on emotion you do it beautifully one night and the next night, it just doesn't come." Whatever Bankhead's personal method, she was able to insert herself totally into her character. An avid baseball fan, Bankhead was a fan of the New York Giants. She once said that, throughout history, there have only been two geniuses, "Willie Shakespeare and Willie Mays." After at least seven books about her life, an off-Broadway musical in the '80s (starring Helen Gallagher) and dozens of female impersonators were followed by three plays about her in 2000. Tovah Feldshuh is the star and co-author of Tallulah Hallelujah! an off-Broadway play in the form of a fictional USO show with Bankhead as host. Nan Schmid, formerly of the Second City improv troupe, wrote and stars in Dahling, in which eight actors portray more than 40 characters in Bankhead's life. And Kathleen Turner, toured the country in a Broadway-bound, one-woman show called Tallulah. In June 2008, a stage play by Matthew Lombardo, entitled Looped, features Tallulah Bankhead (portrayed by Valerie Harper) as the protagonist in an episode late in her life in which she is called to a recording studio to "loop" a line of recorded dialog that must be dubbed into a film shot previously. The session reportedly took eight hours to successfully record a single line of dialog, and the playwright uses the situation to reveal the story of Bankhead's life. Looped premiered at the Pasadena Playhouse in California under the direction of Rob Ruggiero. ↑ Home Hiwaay, Beginnings - Tantrums and Turmoil. Retrieved August 20, 2008. ↑ 2.00 2.01 2.02 2.03 2.04 2.05 2.06 2.07 2.08 2.09 2.10 2.11 Joel Lobenthal, Tallulah! : The Life and Times of a Leading Lady (Regan Books, 2004, ISBN 0-06-039435-8). ↑ "Tallulah Bankhead," Dictionary of American Biography (American Council of Learned Societies, 1988). ↑ Home Hiwaay, Tallulah Bankhead—Biography. Retrieved August 19, 2008. ↑ 5.0 5.1 AWHF, Alabama Women's Hall of Fame. Retrieved August 19, 2008. ↑ Home Hiwaay, Tallulah Bankhead. Retrieved August 19, 2008. ↑ Time, Tallulah Times Three. Retrieved August 20, 2008. ↑ Pasadena Playhouse, Production Website. Retrieved August 19, 2008. Archibald, Alecia Sherard. 2003. Tallulah Bankhead: Alabama's Bad Girl Star. Birmingham, Ala: Seacoast Pub. ISBN 1878561456. Bankhead, Tallulah. 1952. Tallulah: My Autobiography. New York: Harper. OCLC 330911. Brian, Denis. 1980. 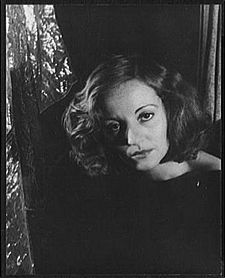 Tallulah, Darling: A Biography of Tallulah Bankhead. New York: Macmillan. ISBN 0025152009. Lobenthal, Joel. 2004. Tallulah: The Life and Times of a Leading Lady. New York: Regan Books. ISBN 0060394358. Tallulah Bankhead. Dictionary of American Biography. American Council of Learned Societies, 1988. Reproduced in Biography Resource Center. Farmington Hills, Mich.: Gale, 2008. Zoglin, Richard. 2000. Tallulah Times Three Time.com. Verbal Turpitude. Aug. 22, 1932. Time.com. The Religious Affiliation of Tallulah Bankhead. Adherents.com. Tallulah the Lonely. Robert Temple. Photographs and literature. Virtual History. Caught With My Facts Down Home.earthlink.net. This page was last modified on 12 November 2015, at 15:46.